For over two decades, PetraSlate has sought to bring only the finest slate products to our customers. 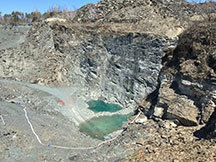 Recently, we had the opportunity to tour one of the quarries of the Evergreen Slate Company in Vermont. Evergreen provides quarry tours to fully demonstrate the process of making slate roof tiles from beginning to end. We attended so that we could gain first hand knowledge about the manufacturing of slate roof tiles, to better advise Denver contractors, architects and home owners on the reason they may want to consider this superior roof tile for their next construction project. The slate roof tiles that PetraSlate brings to market in Denver is from “The Slate Valley” in Vermont, which is approximately 24 miles by 6 miles and has been quarried for slate for over 150 years. Slate deposits were first discovered in the area in 1839, but before the widespread advent of steam power, quarrying it and transporting it was too impractical to be economically viable. The arrival of experienced European quarrymen, and the advent of early railroads changed this situation as depicted at the Slate Valley Museum. Today, the area around Dorset remains an intriguing mix of colonial architecture, as exemplified by the oldest continuously operating inn in the country, the Dorset Inn, and the Industrial Age row houses of those workers of yesteryear. The manpower drain of World War II saw the slate quarrying industry change forever, becoming far more mechanized, with an eye on limiting environmental degradation. What remains the same is that The Slate Valley continues to produce the finest slate roof tiles found anywhere. Much like gold or silver, commercially viable slate runs in veins and must be prospected before quarrying. As much as 90 percent of the surrounding material amounts to rocky waste with limited commercial value beyond the loose-stacked rock walls and other rock landscaping features found throughout New England. At least such reclaimed stone projects are improvements over the enormous tailing piles of the past. Once the slate has been exposed by blasting, heavy equipment scoops away the loose aggregate so that blocks of slate can be cut away from the vein and transported for further processing at the Evergreen Slate Company, the largest such concern in the United States. The processing of raw slate into roof tiles will be the focus of Part II.